I like both of your Pieta Jennifer! 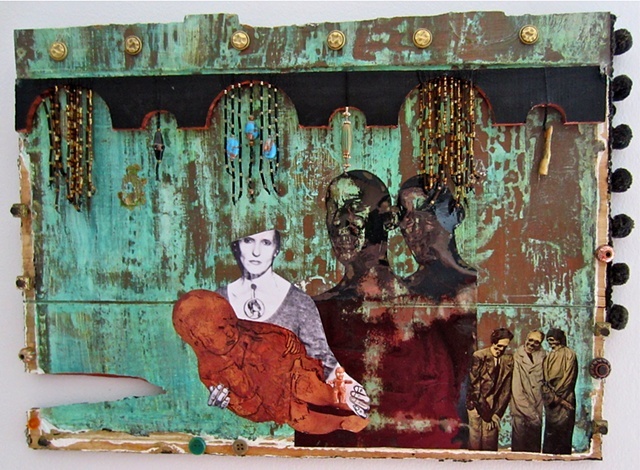 I love the assemblage, beautiful color and I love the 3 people in the right lower corner. As always creative and imaginative. Sensational piece Jennifer. Take care, keep creative, and, hello. How very creative is this..! Fabulous creation , amazing details and composition . Superb artwork, I love it !!! Muito belo, mágico e arrebatador. Sublime Jennifer. Abraços. Another excellent piece. Your artwork has an enormous range of meaning. fantastica !!!!!!!!!genial! !un saludo y buena semana!!! I love the shape of this!!! very nice work. This is a different style for you. I like it. Outstanding assemblage, a very old tradition is alive and well. Fine work. this is a deep and strange creation - it seems to slide inside the mind and I know i will not forget this! interesting work... I particularly like the two dark, and slightly menacing figures in the background. Imaginative & creative designing ! A haunting image. Spooky characters, balanced by the innocence of the sleeping baby. Your work is just amazing! You are so talented! Excellent art from a cool artist. A really moving piece of art Jennifer. a genial interpretation, there is your signature here ! my best wishes for a superb 2015 Jennifer ! Oh i love this my friend,Beautiful!! !